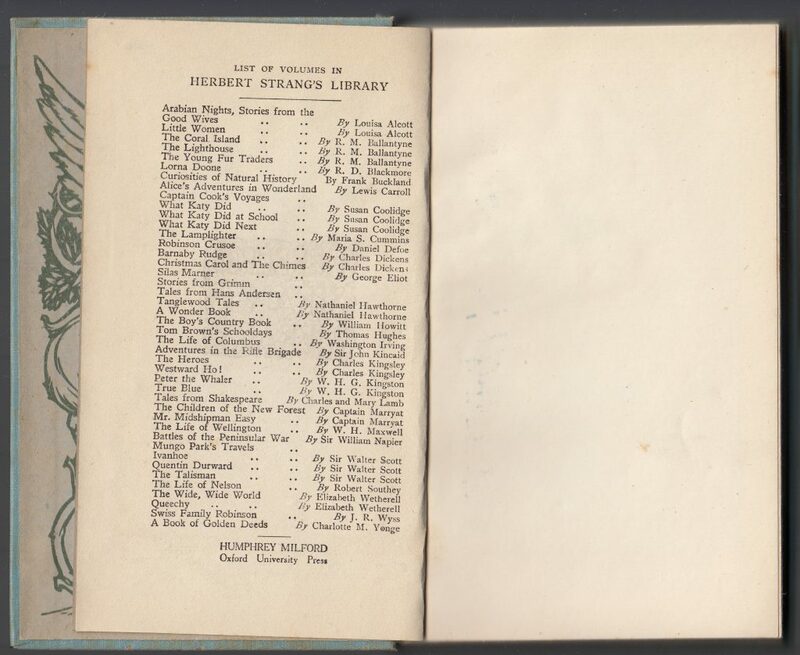 Herbert Strang was the pseudonym of the writing team of George Herbert Ely (1866–1958) and Charles James L’Estrange (1867–1947) (source). The series name combines the middle name of Ely (Herbert) with the slightly modified last name of L’Estrange (Strang). Ely and L’Estrange first met when both were seeking employment with the publisher Blackie in Glasgow. Blackie’s best-selling author, G.A. Henty had died, and the firm was exploring options for new authors. Ely was a fan of Henty’s work and thought he could emulate his success as an author. A proposal to Blackie involved a joint effort, between Ely and L’Estrange, using the pseudonym Herbert Strang. L’Estrange typically sketched out the book plots, and Ely did the writing (source). 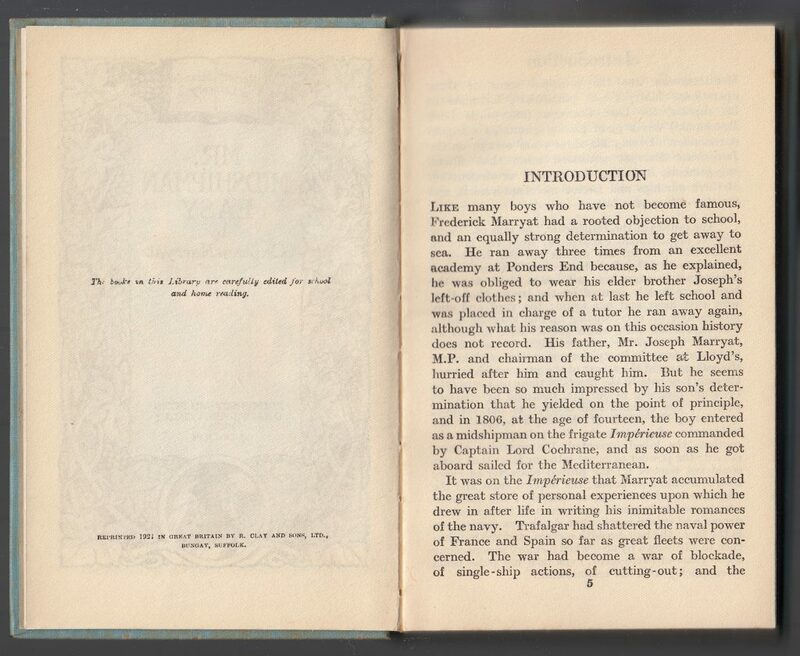 Their first book, Tom Burnaby, was published by Blackie in 1904, to rave reviews. More titles followed, all praised for historical accuracy wedded to engaging stories. Many of the Strang novels were aimed at what we would call a young adult audience. According to the History of Oxford University Press: Volume III: 1896 to 1970 (edited by Ian Anders Gadd, Simon Eliot, and William Roger Louis) the collective pseudonymous Strangs were responsible for over 1000 titles selling at least 1,400,000 copies in the first half of the 20th century. Some of the titles were novels, but others were Annuals and edited readers. Series included Herbert Strang’s Annual for Boys and Annual for Girls, The Red Book Series, The Herbert Strang Series, the Kingston and Henty Series, The Holiday Series, The New Fifteenpenny Series, The Flag Series, The Acme Series, Herbert Strang’s Library, Herbert Strang’s Readers, and Herbert Strang’s Romance of Modern Invention. 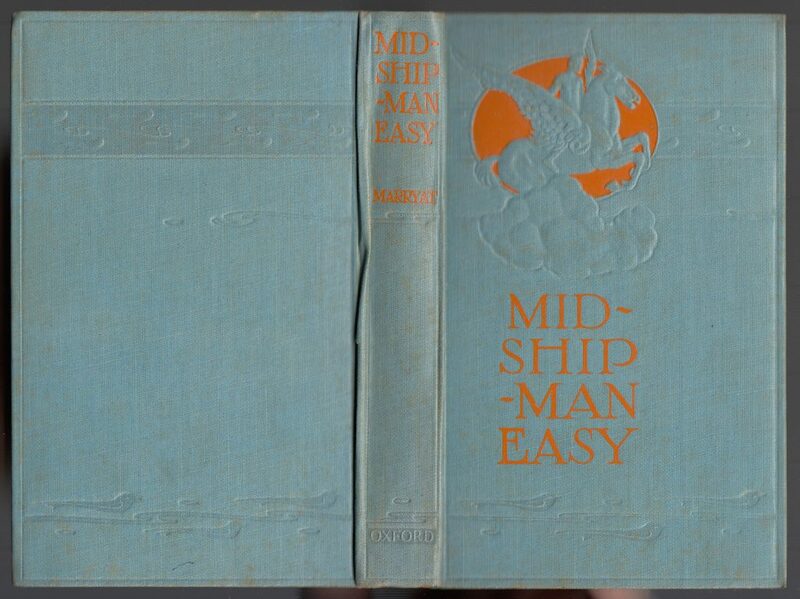 Herbert Strang’s Library series appears first in 1909 and wound down by WW2 when Ely and L’Estrange retired. Titles included those explicitly written for teen readers and acceptable classics, edited for home and classroom use (in other words, expurgated). A few reprints trickle out through the early 1950s, but 1942 is a good end-date for the series. A total of 61 titles were issued. 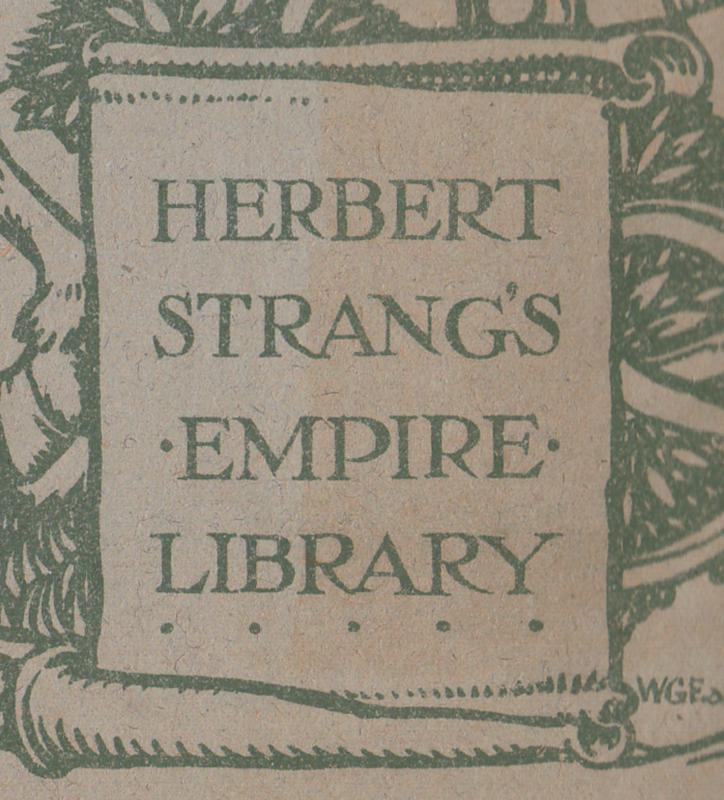 Herbert Strang’s Empire Library was, it seems, the name used for Herbert Strang’s Library titles sold in the Empire: Canada, Australia, New Zealand, etc.. “Empire” titles appear in WorldCat from 1920-1935 and on Abebooks.com from 1913-1922, and it is probably safe to say that the Empire versions were sold in approximately the same time frame as the “mother” series. The Empire copies include Empire in the series name on the jackets and endpapers. 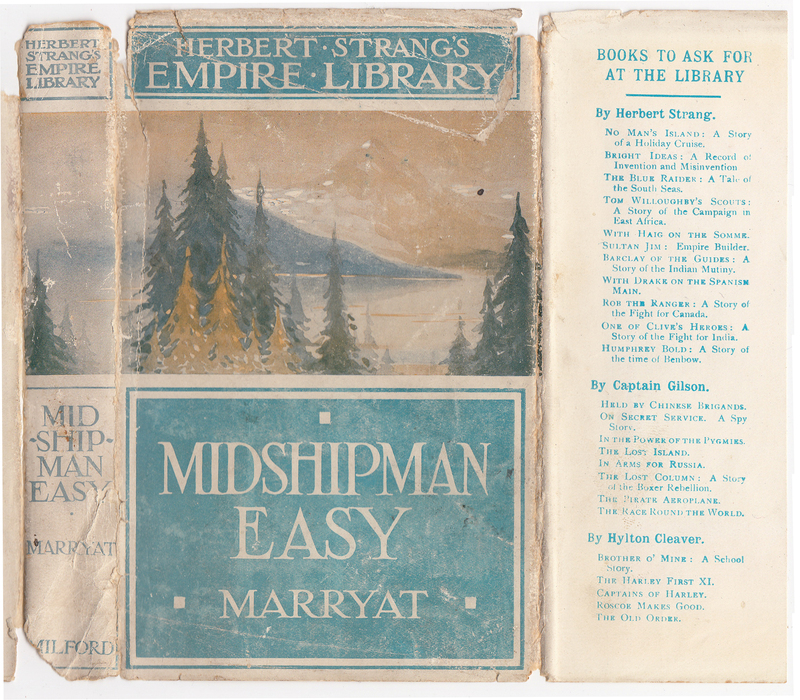 Once inside the book, past the endpapers, “Empire” disappears and indicators are to Herbert Strang’s Library. I’ve yet to find a statement about the reason for the “Empire” copies. I suspect it had to do with distinguishing the books to be sold outside of the UK from their UK counterparts. There was potentially an issue with copyright (some titles were available in the UK, or the “Empire,” but not both), or possibly there was concern about UK copies being sold in the Empire, or visaversa (and competing with the home version of the series). The blurb continues: each title has an introduction with biographical background on the author, and that notes, plans or maps are included when necessary. 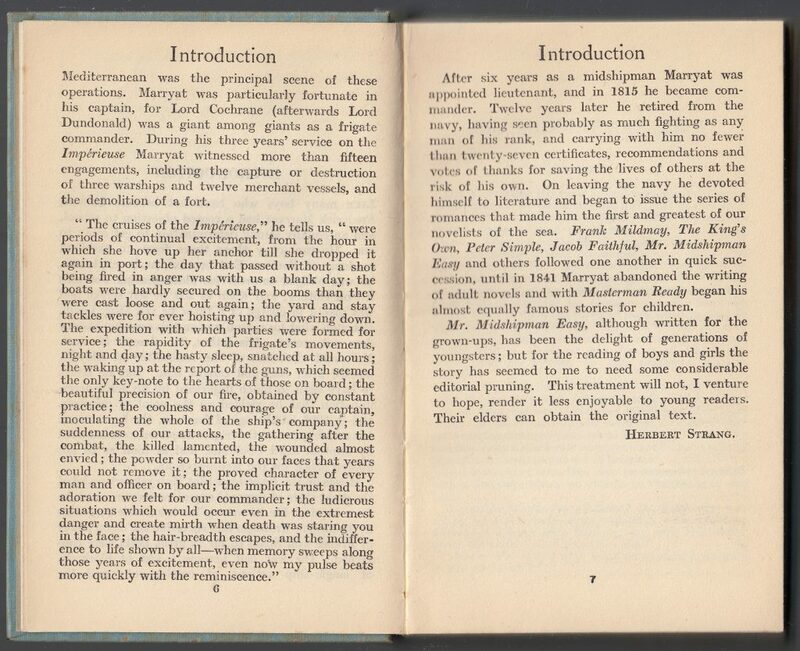 The books are carefully edited (expurgated) for young readers and are illustrated with plates by H.M. Brock, James Durden, A. Webb and other illustrators. 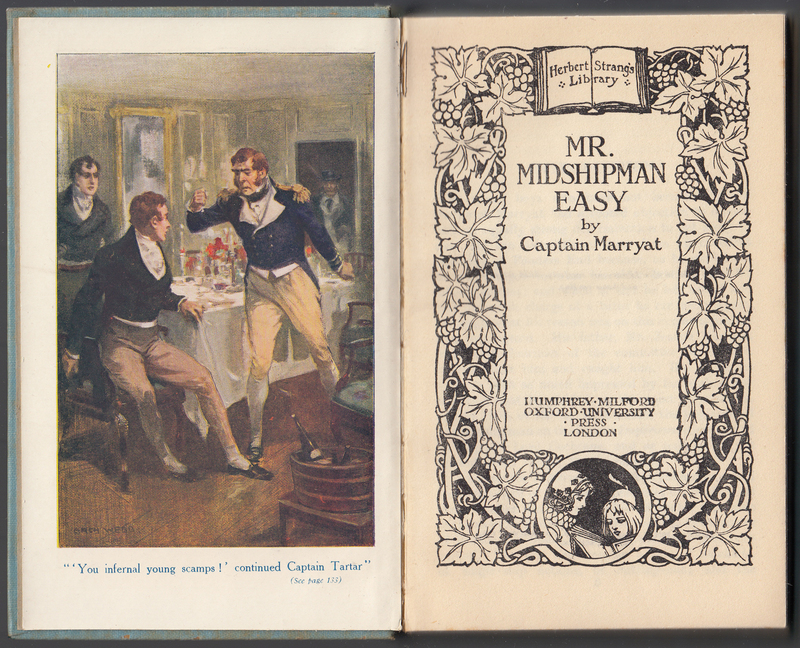 Captain Marryat’s Midshipman Easy has a reprint date of 1921. This copy is one of the Empire copies (it was purchased from a Canadian used book dealer) and is post-Hodder & Stoughton. The series name is included on the top of the jacket spine and top of the front of the jacket. Oxford must have seen the Herbert Strang name as an important brand for books suitable for young readers. The jackets are, in the period this book was printed, unique to each title with an illustration that wraps around the front and spine of the book. From examples I’ve seen online, unique jackets were used from the beginning; Hodder & Stoughton and Oxford copies (pre-1916) did not seem to include the series name on the jacket; after 1916 the series name is on the jacket spines and fronts. In the mid-1930s a common jacket design (in different colors) is employed. Some titles retain their unique, illustrated jackets all the way up until the early 1940s. 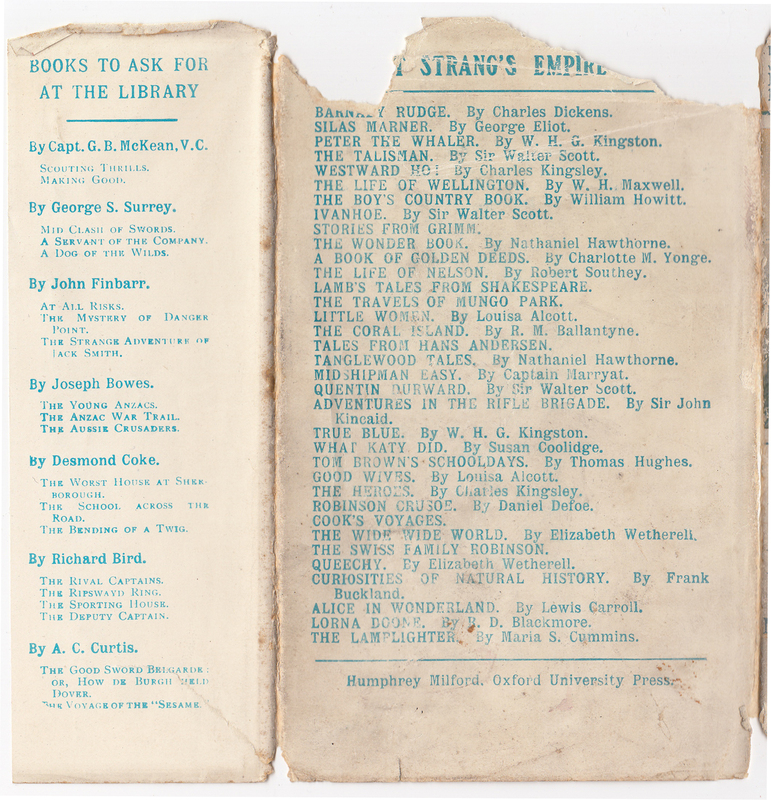 The front jacket flap includes advertisements for other books, “to ask for at the library,” by Strang, Captain Gilson, and Hylton Cleaver. More books to ask for at the library continue on the back flap of the jacket. The back of the jacket lists titles available in the Empire version of the series as of 1921. Bindings for the series were more elaborate than the typical series book, with bright colors and rather elaborate designs debossed on the book front, spine and back. The copy below has a Pegasus design that was used on different titles. Binding designs are sometimes common (with the exception of the book’s title and author) but other times are unique to a title, with illustrations or rather elaborate and effusive design. Plainer bindings appear as early as 1918 without the elaborate designs and printing and appear on and off through the 1930s when a common design seems to appear and be used for subsequent copies. Some titles seem to have been available in paperback bindings. The endpapers repeat the Pegasus imagery, along with elaborate arts and crafts elements, with a young reader tucked into the lower right corner. 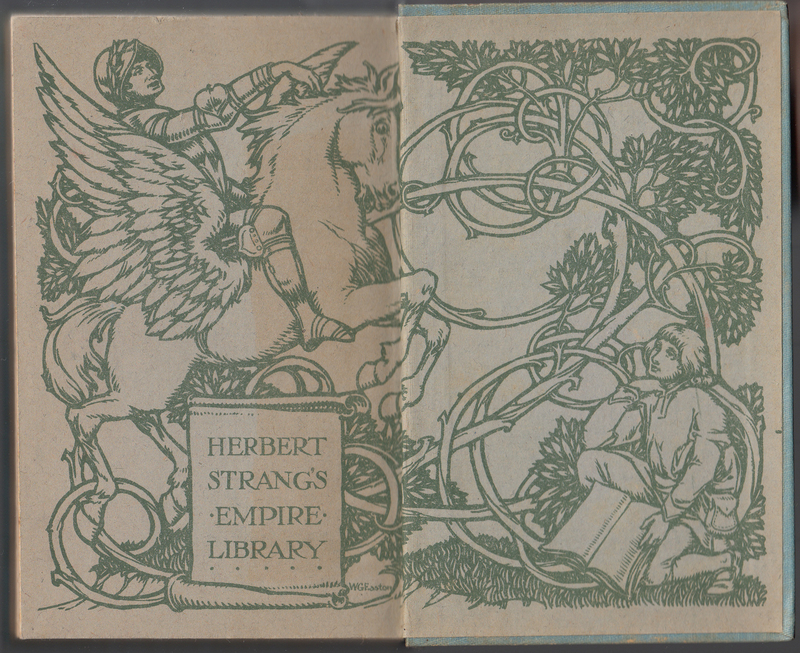 Herbert Strang’s Empire Library is placed in a scroll; for UK copies, the “Empire” is dropped. The illustrator is W.G. Easton. The insides of the book no longer put “Empire” in the series name. What I guess would be the half-title page includes an elaborate colophon for the series. 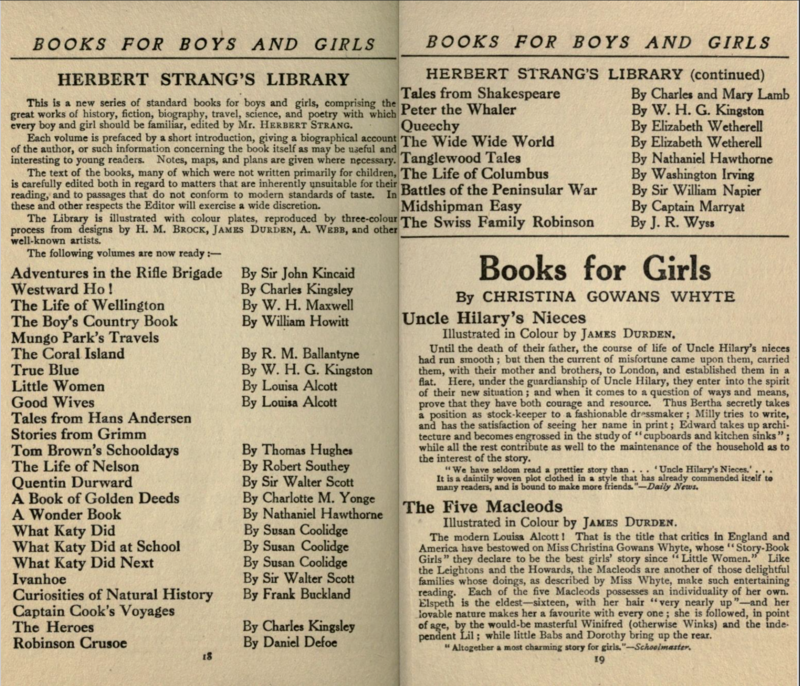 A catalog of titles for “Herbert Strang’s Library” follows the half-title page. A color plate illustrating a scene from the book (the only illustration in the book) faces the title page. The title page has elaborate designs which correspond to the designs on the book in general. 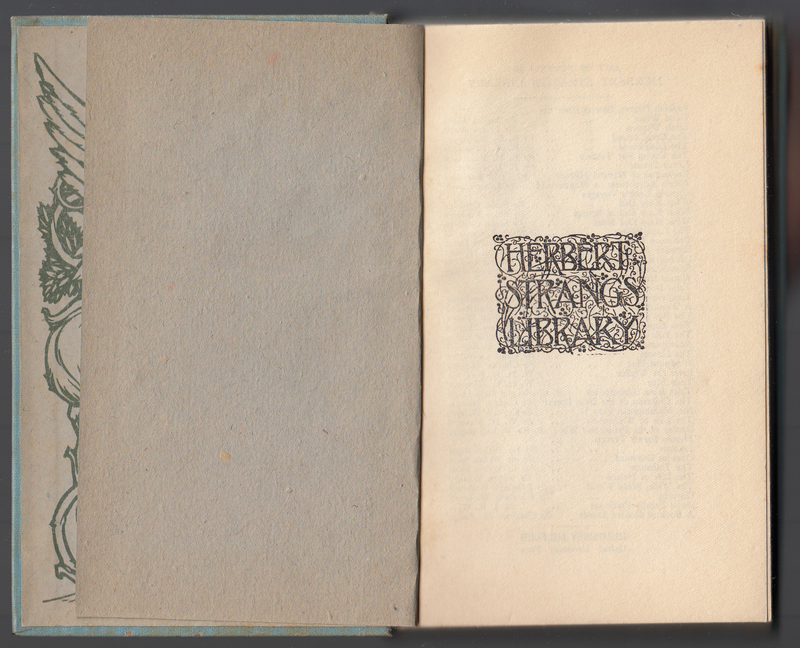 Herbert Strang’s Library is at the top of the title page. The copyright page indicates that “The books in this Library are carefully edited for school and home reading.” Near the bottom is indicated: “Reprinted 1921 in Great Britain by R. Clay and Sons, Ltd., Bungay, Suffolk.” The facing page includes the introduction to the book (these brief introductions were part of each book in the series). The introduction is signed Herbert Strang.